Make Finding Nemo birthday party theme a focal point for your special celebration! Here are some ideas to help you plan your party. You can write your Finding Nemo birthday invitations on colorful pieces of construction paper. Fill plastic resealable bags with some sand, tiny sea shells and plastic toys (like starfish, turtles, etc). Place invitations inside the bags and hand-deliver to your party guests. Secondly, you can send your invitations along with plush or plastic fish (available from a party store). Put them in small boxes, and mail to your Finding Nemo birthday party guests. This will create a nice surprise for all the kids! Lastly, download and print images of Finding Nemo characters on the front of white invitation cards. Write birthday party details on the inside, and invite your child to help you with putting theme stickers on the cards. Best colors for your Finding Nemo party decorations are orange, lime green, yellow and blue. Print pictures of Marlin, Nemo, and the gang. Next, tape them to the fence to mark your party spot. Drape fishnet over the fence (or over a fixture in the yard), and attach some plastic tropical fish figurines and cutouts. Play Finding Nemo theme music in the background. Spread lots of green paper streamers for seaweed, clear balloons for bubbles and plastic fish throughout your driveway. (Kids will love the idea of going through the sea.) Fill several kiddie pools with water, and spread them around the yard. If you possess an artistic inclination, then design a Shark standee by drawing and cutting shark out of solid paper. Cut out shark’s mouth, so the kids can get their pictures taken, putting their head “inside the mouth”. You can also purchase a similar standee from a party store – so it saves you a lot of time. Cover the lights in the room with blue cellophane paper, which will give the party “under water” feeling. Scatter theme toys and items around the room. Fill the ceiling with blue helium balloons, and have blue latex balloons free-floating around the floor to create “ocean atmosphere”. Hang Finding Nemo posters on the walls. Decorate your Finding Nemo birthday party table with a theme tablecloth. Place a large seashell (or other “ocean” item) for a centerpiece. Tie some colorful balloons to the back of the chairs. Hang a personalized “Happy Birthday” banner in the area. *Nemo Tattoos: Provide your Finding Nemo birthday party guests with removable theme tattoos that they can stick on their bodies. *Fish for a Name Tag: Create a fish-shaped name tag for each child using thick, colorful paper. Decorate the name tags with markers and attach a paper clip to the mouth of each fish. Place all name tags in an empty kiddie pool or decorated box. As kids arrive, give them a fishing pole (sturdy stick with a yarn “line” and a magnet “hook”), and get them to “catch” one of the fish-shaped name tags. 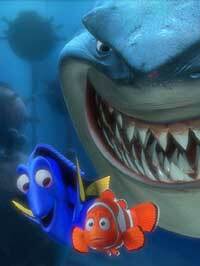 When a fish is caught, write the guest’s name on it or give them their favorite Finding Nemo character name. *Sea Life Mural: Tape a wide sheet of butcher paper on the wall at kids’ eye level. Spread posters and pictures of tropical fish, dolphins, sharks, and other sea animals for ideas. Provide the kids with paints and markers, and let them create a mural of sea life. *Clown Fish Party Activity: You can get a Clown Fish Tote Bag craft kit from a party store. Have the children decorate their tote bags while they are waiting for others to arrive. For your Finding Nemo party favors, have such items as squirt fish, plastic fish bowls, sea life putty, gummy candy sea critters, Finding Nemo bubble solutions, sticker sheets, plastic starfish, plush fish, and so on. *Squirting Gallery: Set up several empty plastic pop bottles at a distance of 10 to 15 feet from where the shooters will stand. Lay a jump rope on the ground for the line that players should stand behind. Give squirt guns to all the players, and see who can knock down the most bottles! For a younger group, decrease the distance between the shooting line and the targets. *Octopus Tag: Pick one player to be the Octopus, and have him or her stand in the middle of a large playing area. Everyone else is a Fish – they must try to run past the Octopus to the other side of the playing area. If fish gets tagged, he or she holds hands with the Octopus and becomes a tentacle to help “get” more fish. The last Fish remaining untagged, wins! *Finding Nemo: Before Finding Nemo birthday party, draw and cut clown fish shapes out of colorful construction paper. Next, hide them around the house or yard. *Underwater Swim: Invite the kids to stand in a circle, facing inward. Choose three sea animals and walk around the circle naming the kids in sequence – whale, turtle, shark, whale, turtle, shark, etc., so you have several of each sea creature standing at intervals. When you call out the name of a group, the players from that group go for a “swim”: they must walk around the circle and listen to your instructions. When you say the sea is rough, they jog around the circle. When you say it’s getting rougher, they run faster. If you say the tide turns, they turn around and run in the opposite direction. *Gill Says: Turn original “Simon Says” game into this Finding Nemo theme version. *Making Waves: Before your Finding Nemo birthday party, wash and dry one bottle and cap for each child. Write the guests’ names on the cap. If there are labels on the bottles, try to peel as much of them off as you can by soaking bottles in warm water. Using a funnel, pour six ounces of cooking oil into each child’s bottle, followed by six ounces of vinegar. Let the kids observe the fluids interacting – the oil goes to the top and the vinegar to the bottom. Then pour several drops of blue food coloring into the bottles, and again let Finding Nemo birthday party guests watch the changes and separations. Close the caps tightly and tell the kids to shake their bottles to make “waves”. For added fun, give everyone tiny plastic toys to put inside the mixture so they can float in a homemade ocean. Plastic confetti and glitter will add sparkle, too. Once all of the materials are added, seal the caps shut with rubber cement or glue to prevent leakage. The kids can make a tornado in a bottle instead of waves. Purchase a “Tornado Tube” (available in most educational supply stores) for each Finding Nemo birthday party guest. Then clean out two large clear plastic soda bottles for each child and have the kids fill one of their bottles up with water and a pinch of glitter. Attach the “Tornado Tubes” to the bottles according to the package directions, and tell the kids to swirl the water-filled bottle and watch the tornado appear. Have the kids take turns throwing beanbags into a pail. Allow children to choose a prize from whatever bucket the beanbag lands in. Make sure that every guest receives a prize. *Take a Trip Underwater: If time permits, take your Finding Nemo birthday party group to a local aquarium to have fun and learn about life under the sea! *Starfish Cake: Purchase your child’s favorite flavor of boxed cake mix. Bake 2 round cakes according to package directions. Let the cakes cool. Leave one cake whole and cut the second cake into five equal pieces (like cutting a pie). These pieces will become Patrick’s starfish legs. Place the first cake into the center of a large piece of cardboard covered with foil. Trim the curved edges of the starfish legs, so that they fit snugly against the round edge of the body piece. Arrange the legs around the body of the starfish and attach with icing. Frost the entire starfish with orange, bright yellow, purple and red icing. Decorate it with colored sprinkles while the icing is still damp to give it a spiny texture. For extra fun, spread blue frosting on the serving tray to make it look like the starfish is in the water. *Finding Nemo Cake: Bake a 9×13″ sheet cake. Print and enlarge an image of Nemo. Then use that image to outline and cut out the shape of Nemo. Finally, frost the sections of the cake accordingly (orange, black and white icings), and place brown M&Ms; for the eyes. *Worms in a Blanket: Purchase hotdogs, refrigerator croissants and cheese. Slice hotdogs lengthwise and cut cheese into strips. Unroll croissants and stuff them with hotdogs and cheese. Roll croissants back up and bake until golden brown. *Seaweed Slaw: Cook three 10-oz packages of French-style green beans according to package directions. Drain and chill for 2 hours. Prepare dressing by mixing 3/4 cup mayo, 1 tbsp lemon juice, 1 tbsp sugar, 1/2 tsp dry mustard, 1/2 tsp salt and 1 tsp onion powder. Stir until smooth. *Clam Chowder: Simply purchase clam chowder (in cans) and warm it prior to serving time. Serve with crackers. *Turtle Shell Treats: Spread a large leaf of lettuce on a plate. Set a pear half (fresh or canned) in the center of the plate to make the turtle’s shell. Cut 2 apricot halves in half to make 4 legs, and place 2 of them on each side of the pear. Add an apricot half to make a head. Finish with mini chocolate chips or raisins for eyes, nose, etc. *Nemo Party Mix: Put 3 cups of ChexĀ® cereal, 3 cups of goldfish crackers, 1 cup of pretzel sticks, and 1 cup of peanuts in a large bowl. Pour 1/2 cup of melted margarine over the top and mix well. Place the mixture in a baking dish. Microwave uncovered on high for two minutes. Sprinkle 4 tbsp of grated parmesan cheese over the mixture. Stir well. Microwave on high for three more minutes. Stir once halfway through cooking time. Let stand for five minutes until crispy. *Gelatin Sea: Cover the bottom of a large, clear bowl with fruit cocktail (about 30 oz). Make gelatin from 6-oz package according to directions. Slowly pour the gelatin over the fruit, and place uncovered in the refrigerator to chill. Once the gelatin has set, cover the bowl with plastic wrap. Keep refrigerated until ready to serve. *Fish Sandwiches: Use fish-shaped cookie cutter and a variety of fillings to create fun kid-sized sandwiches. *Sea Shell Snacks: Fill sea shells with various snacks like nuts, chocolate chips, shredded coconut, fish-shaped crackers, banana chips, dried fruit pieces, etc. *Beach Pail Sundae: Serve vanilla pudding, whip cream, and crushed OreoĀ® cookies in beach pails. *Shark Punch: A day before the Finding Nemo birthday party, make “shark ice cubes” by freezing gummy shark candy in ice cube trays filled with water. Let the trays stand at room temperature for about 20 minutes to remove air bubbles. Prepare drink mix, such as Kool-AidĀ®, according to package directions. Pour into a punch bowl and add 2 liters of ginger ale. When serving, place 2 or 3 “shark cubes” in tall, clear glasses and fill with punch.